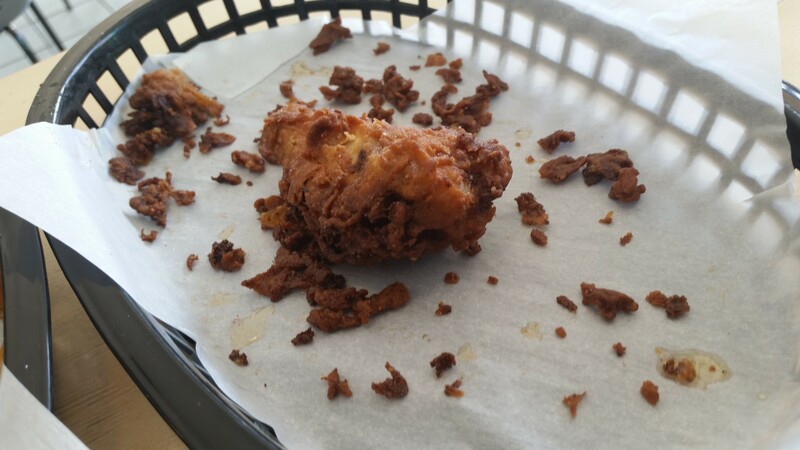 The fried chicken wings were fresh however tasted average. They werent spiced enough and were very salty. 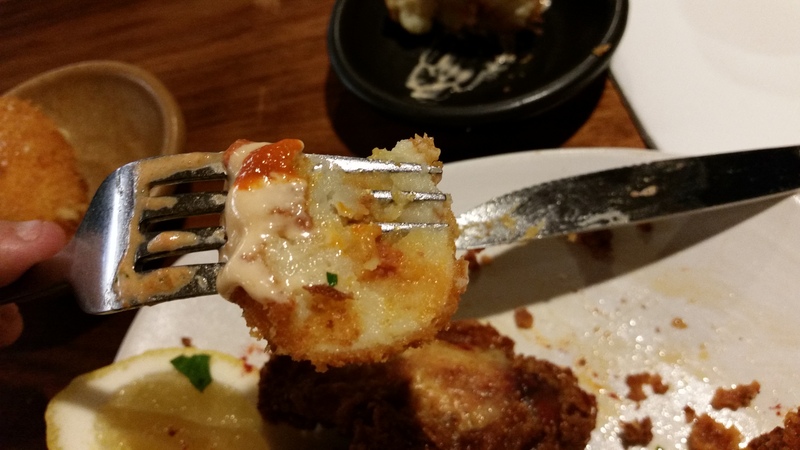 The accompanying sauce did add a bit of good flavor. 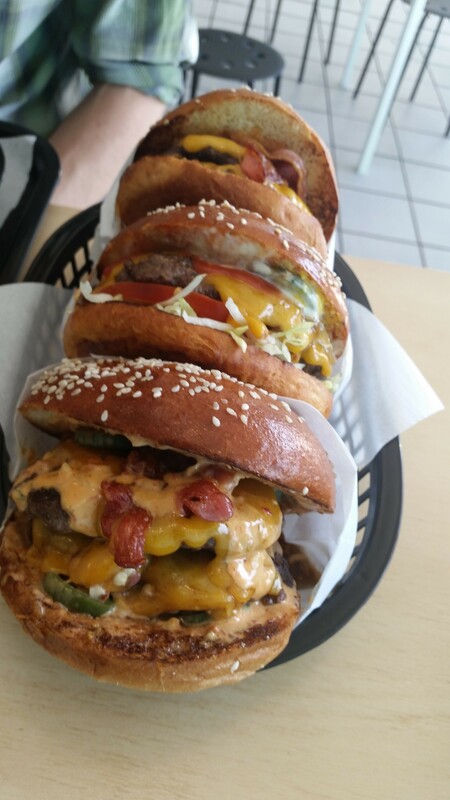 However The Dude Food Man packs in a punch with the greasy yummy burgers which are some of the best out there. Go give it a Go! Hollywood was stranded in Sydney airport because of the Melbourne fog . 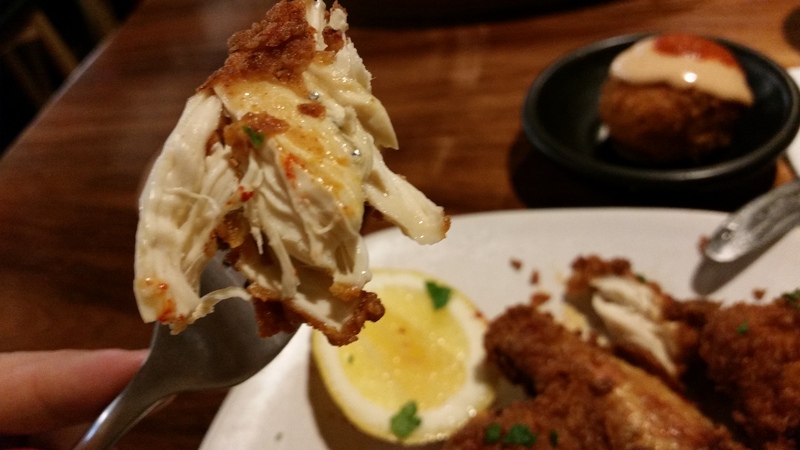 With enough time to spare before the rescheduled flight back home he decided to take a trip to Movida fried chicken town. The chicken was very well spiced and the lemon made a great difference. 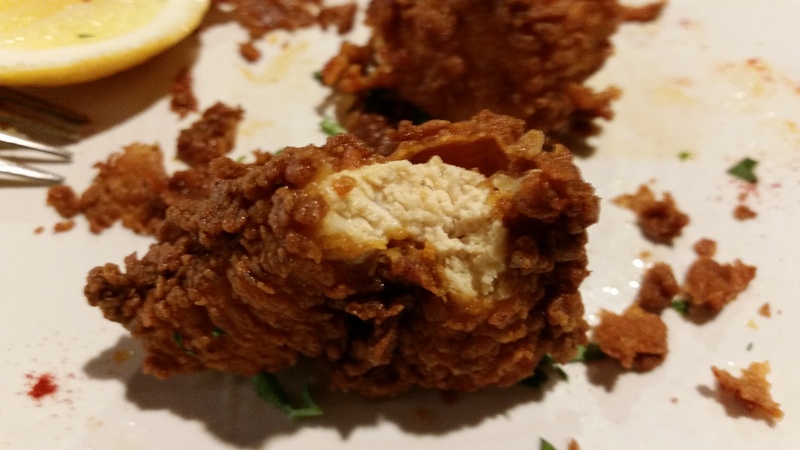 Chicken pieces were so fresh, crunchy and tasty. 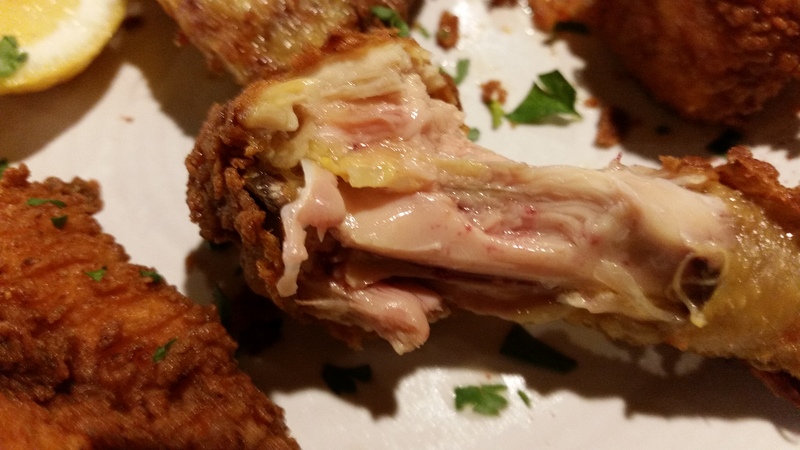 The bone pieces lacked some of the spices but were still gobbled down in an effort to leave no chicken piece behind. If you are ever at Sydney or Melbourne airports and have time to kill, do yourself a favor, skip the junk meals and head straight to Movida. You will not regret it at all. The Chick was lucky enough to be in the Good Ol’ USofA during the Northern Summer – escaping the worst of the Melbourne winter. 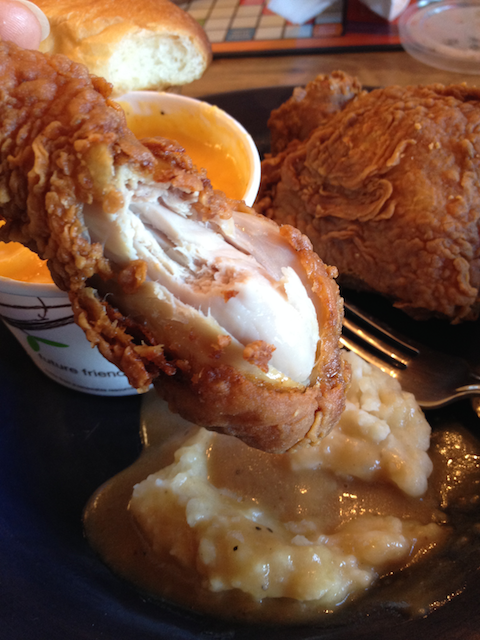 And while it crushed her to savor Fried Chicken without Hollywood, it had to be done. 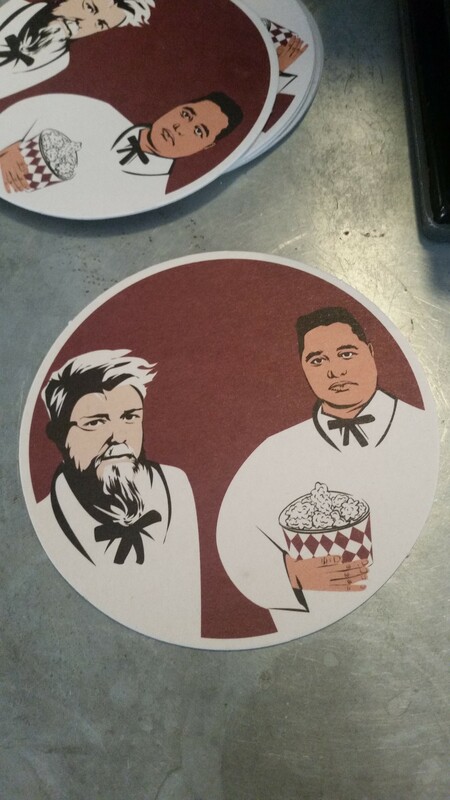 Friends “K” and “J Cluck” knew of the best Fried Chicken in Seattle, complete with legal drama and Oprah link. 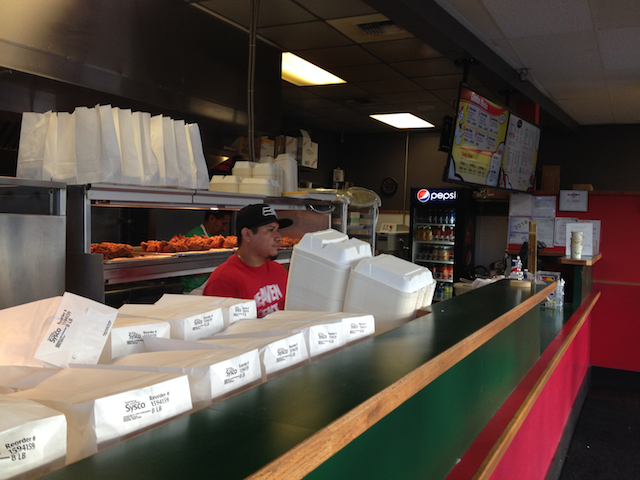 It all began with Ezell’s Fried Chicken in Lynnwood. 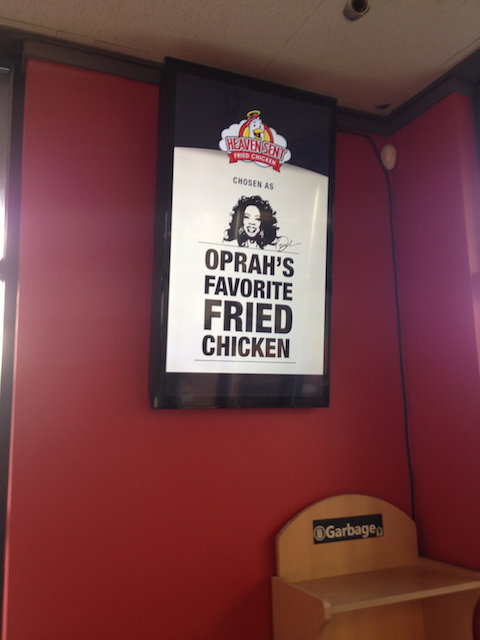 Purported to be Oprah’s favorite chicken, and started by Ezell Stephens and Lewis Rudd. 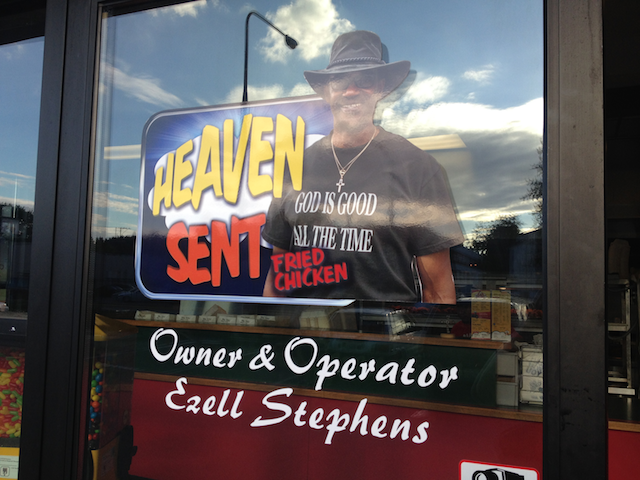 Somewhere along the way, Ezell and the rest of the EFC crew split and Ezell started his own chain, branded “Heaven Sent” and using the same breading recipe. The Chick, K and J Cluck had a free day, thanks to the Labor Day holiday and decided to grab a meal before the final scrabble game of the trip. 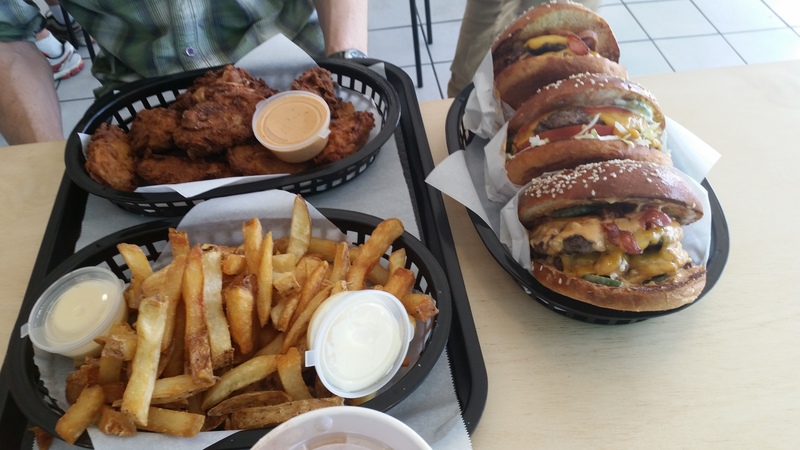 The menu gives a lot of options for sides and chicken styles. 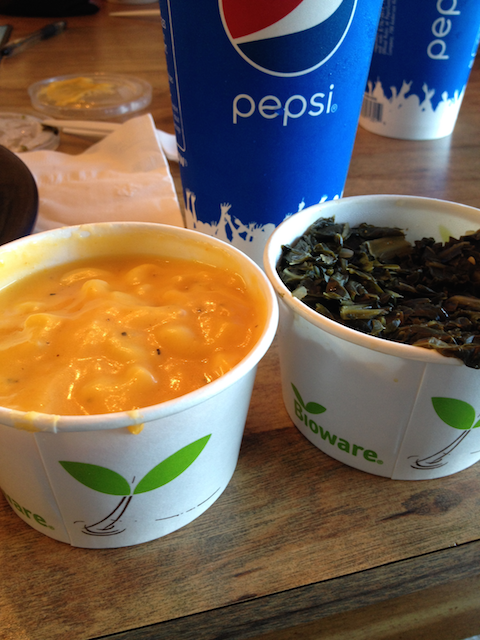 The Chick got the 2 Piece Meal with small sides (Mac n’ Cheese, obviously, and Collared Greens) and a large Soda (Root Beer for nostalgia’s sake). We only eat the finest fast food! 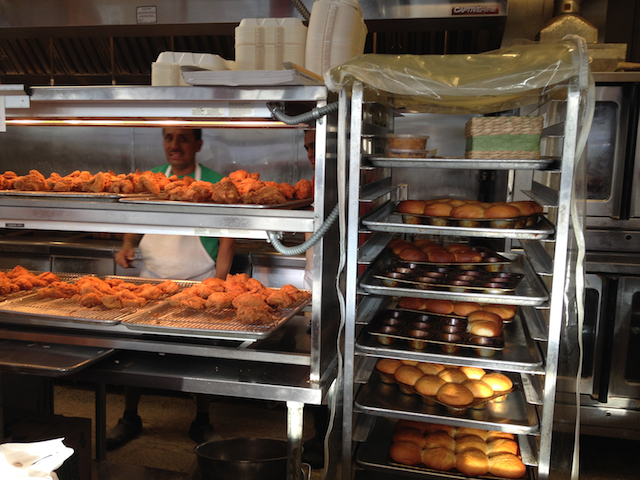 The chicken is made in large batches and it was not a busy day, so our chicken sat under the lamps a bit too long. 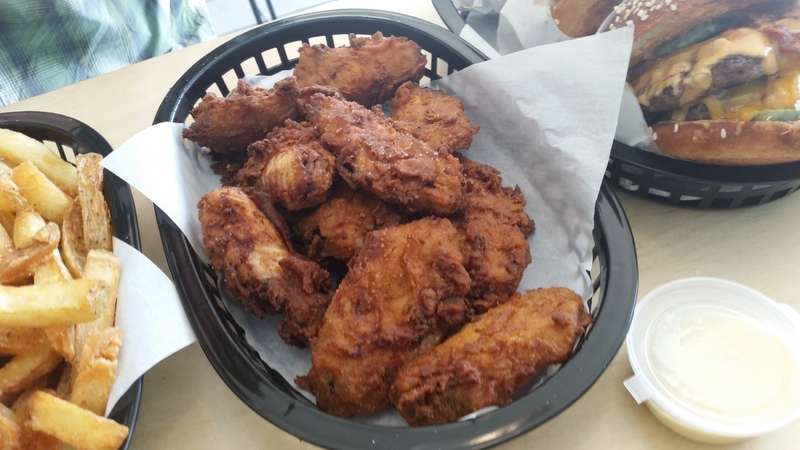 The biscuits were fluffy and soft, not the KFC style, and a touch sweet. Good for soaking up gravy. 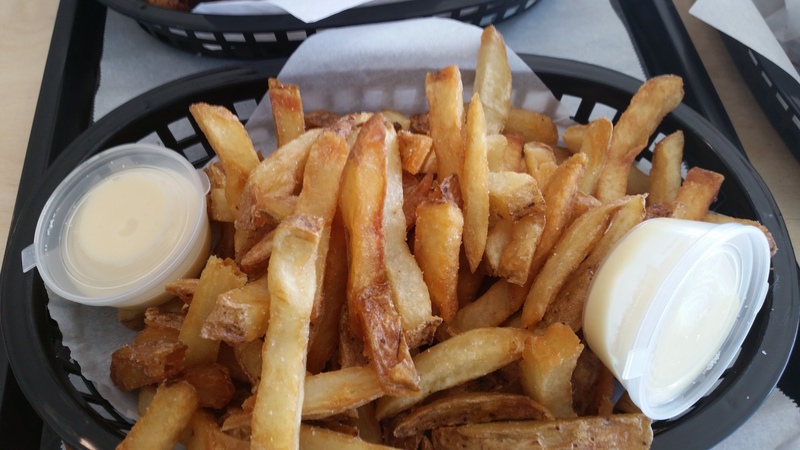 The sides were pretty good for fast food. 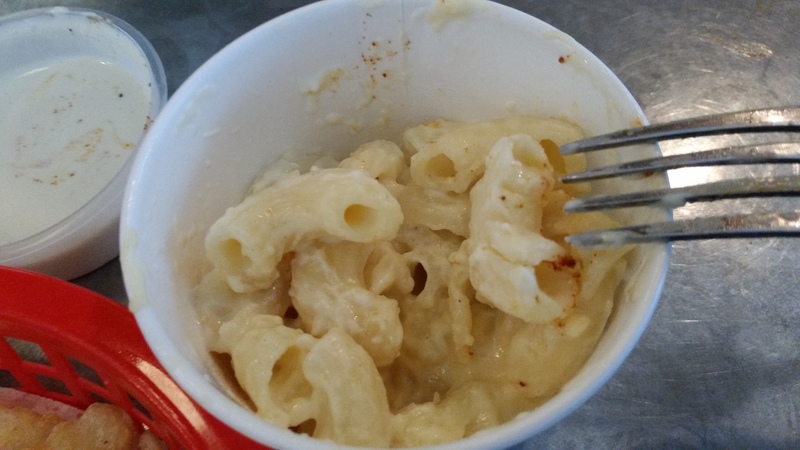 The Mac n’ Cheese was gooey and a bit peppery. The collared greens were over cooked, but you gotta have something green to balance out all the carbs and fat! Leg and Thigh. Always go for the dark meat. 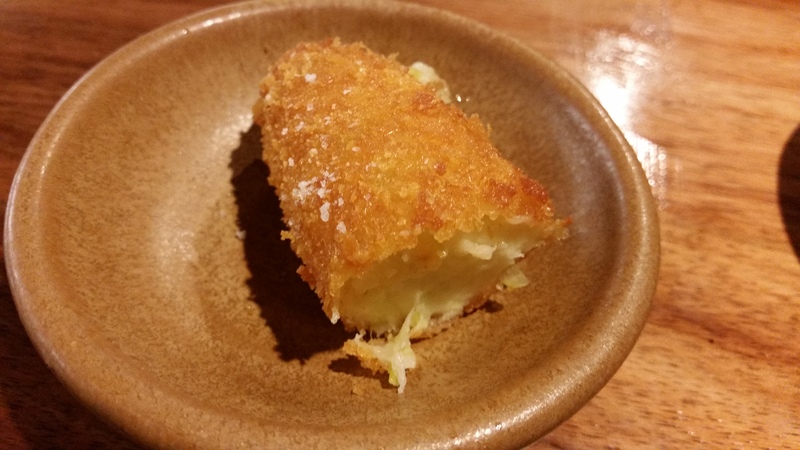 The meat was juicy, the breading was thick and the skin was crispy. 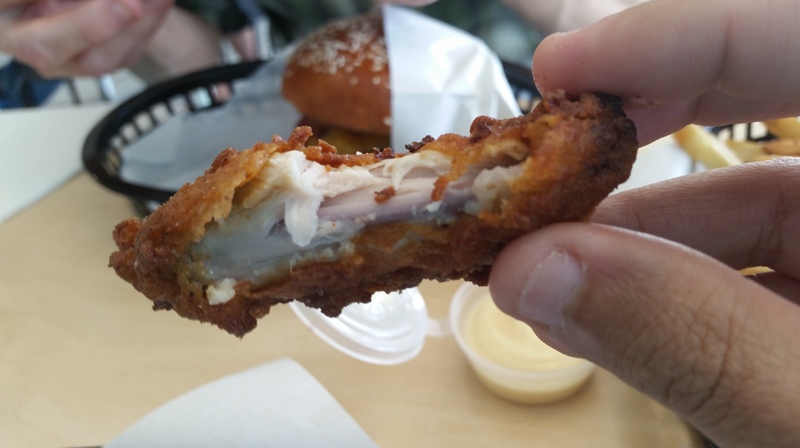 The coating was flavorful and not too greasy. 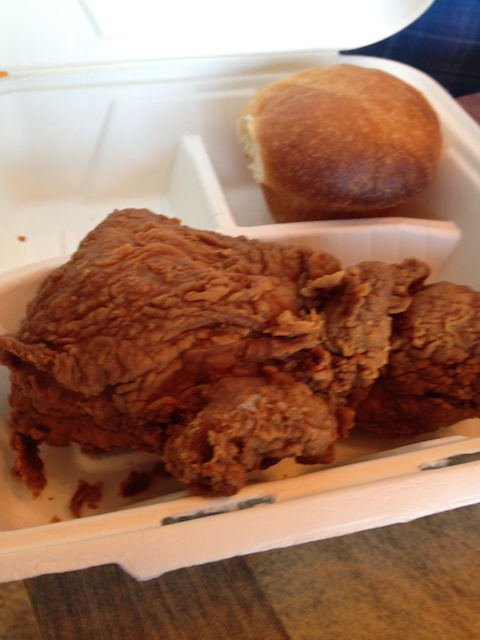 The skin was the best part as it should be with Fried Chicken. 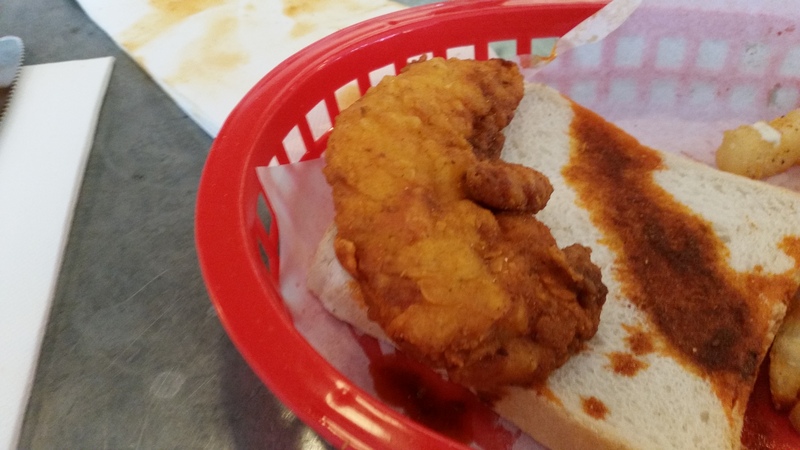 The Chick isn’t convinced this is the best Fried Chicken in the states, but it is served Fast Food style, so given the price and convenience, this is a recommended stop on your way through Seattle. 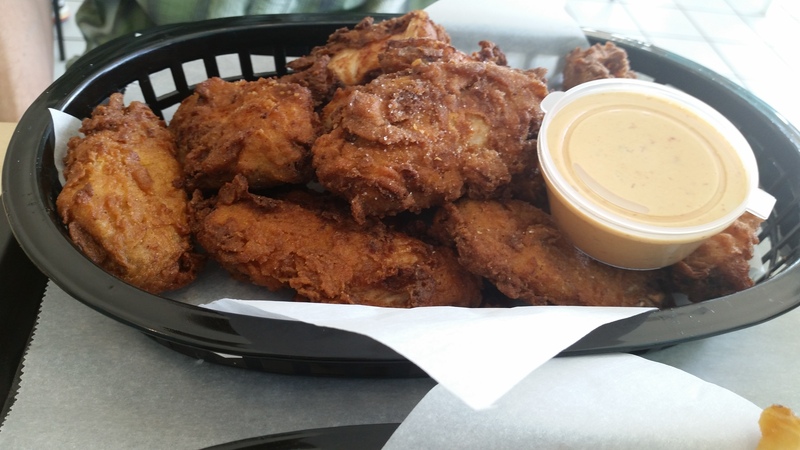 Belle’s Hot Chicken has been highly anticipated by The Chicken Scene ever since news leaked out that Belle’s Diner would be transformed into a Nashville style chicken restaurant. 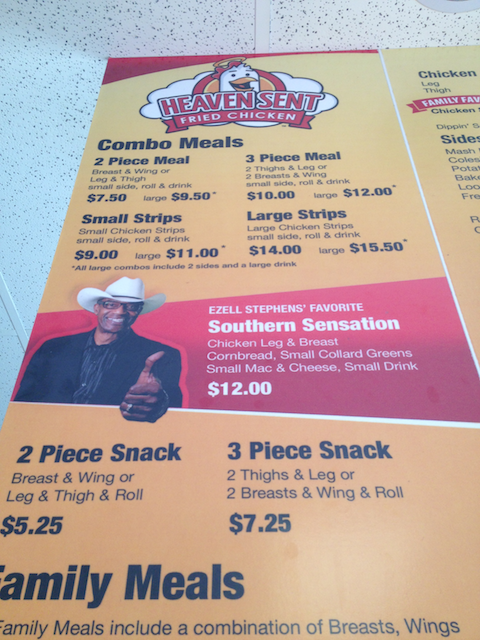 The way the menu is setup was a clear sign that this will be a huge Melbourne Fried Chicken contender. 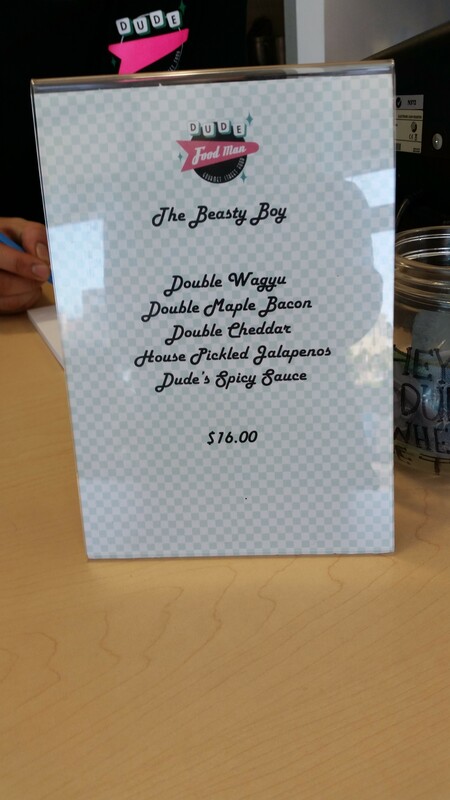 The menu is simple yet so dynamic at Belle’s and is based off of a Meat and Heat combination. 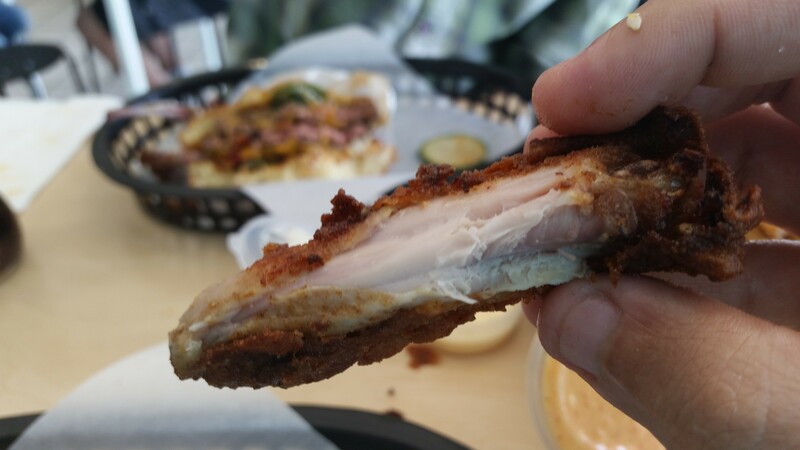 You get to pick the cut of meat you want (Wings, Tenders, or Dark Meat) and then you get to pick the Heat (Mild, Hot, Very Hot, and Very F***ing Hot). Pure Genius! Hollywood was a lone wolf for this mission but was really hungry so ended up ordering the tenders with the heat level of Hot, Mac-n-cheese and the fries with a side of blue cheese sauce. 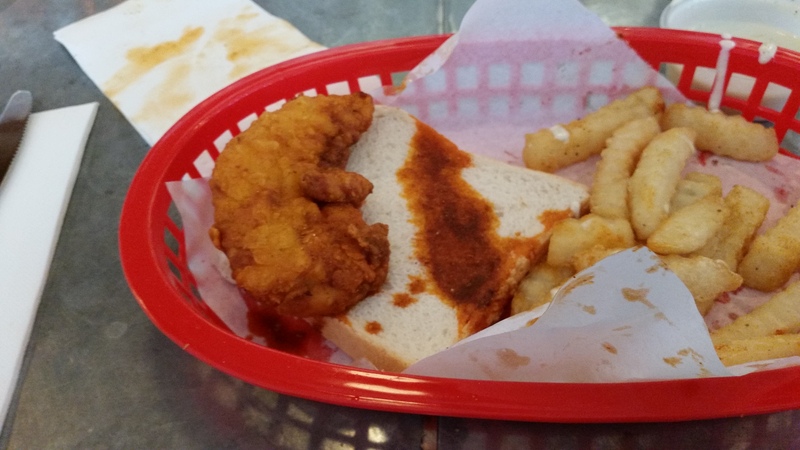 The chicken came out in a basket with the fries, while the mac-n-cheese came out in a side cup. 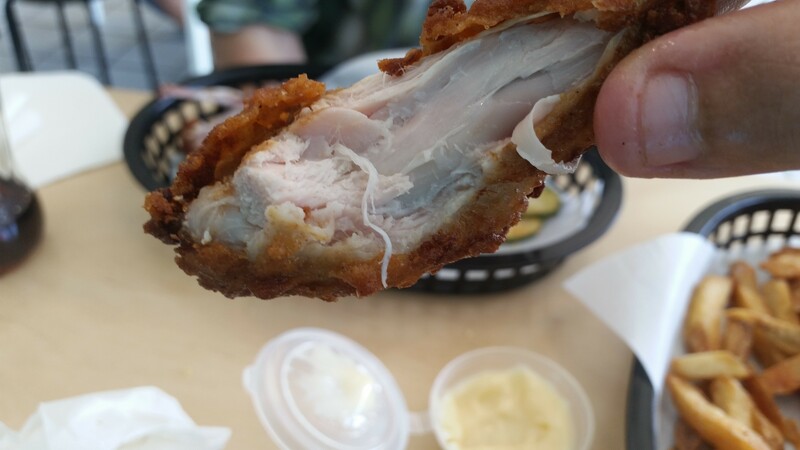 The chicken consisted of 3 pieces and hot it was. It was freshly cooked, and was steamy and juicy. The spices were really good and factored a lot into the heat level of the chicken. The breading was a single coat of breading but was satisfying. 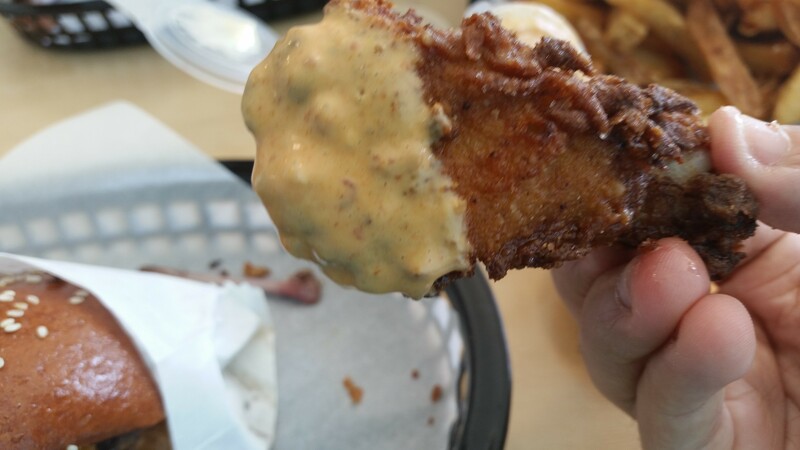 Dipping the chicken into the blue cheese sauce made a winning combo. 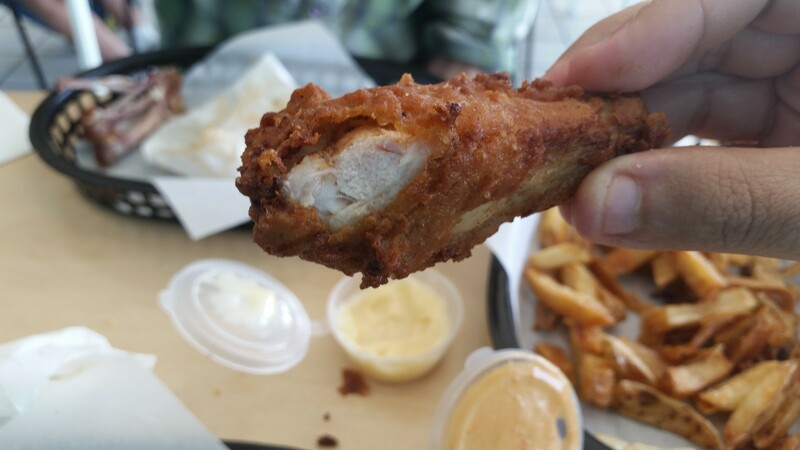 This chicken was a champion. 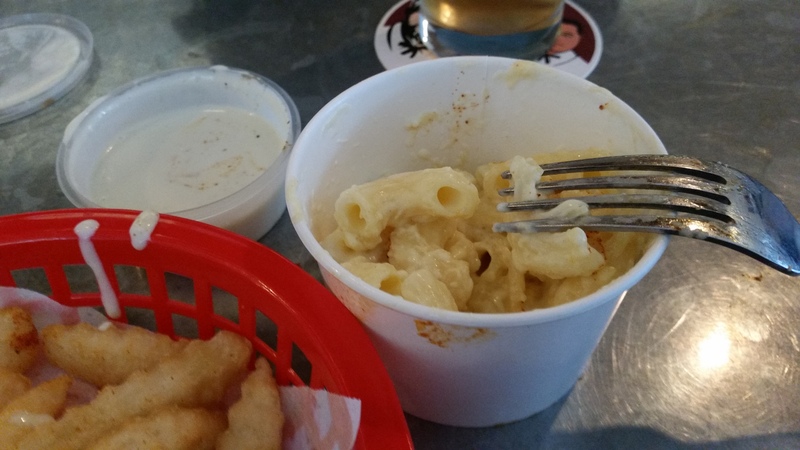 The Mac-N-Cheese was a little bit spicy and was very creamy which was a good combination while the fries were evil good. 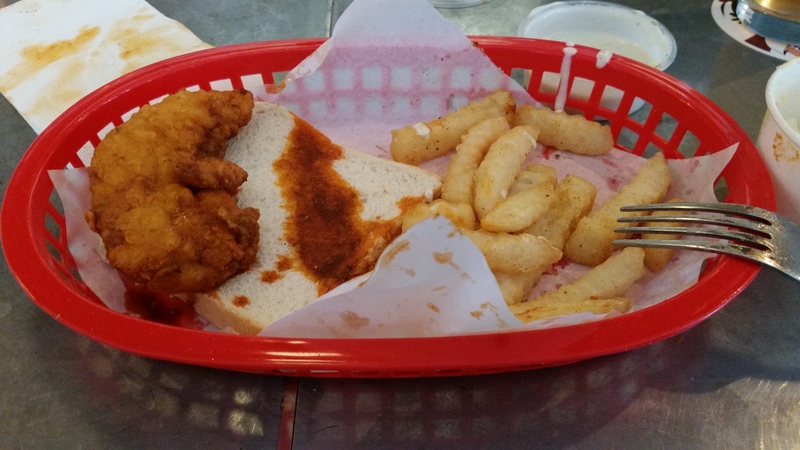 Belle’s Hot Chicken is very well worth it and is one of the best crispy Melbourne Fried Chicken adventures. 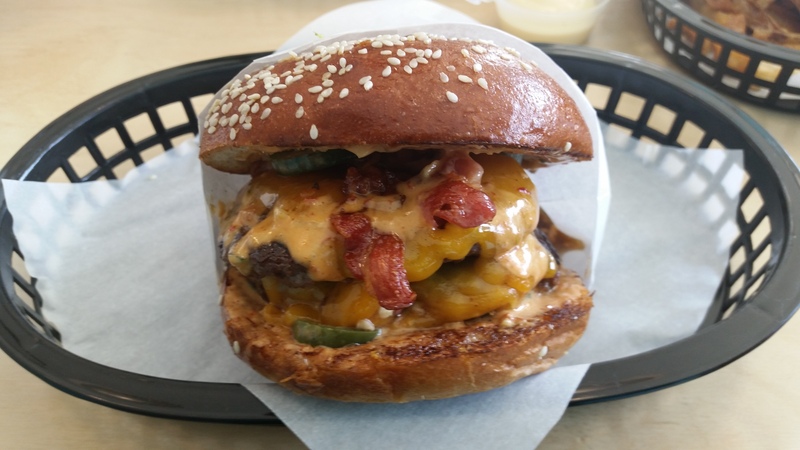 It is one of the places that has focused solely on the chooks as its main star. We are eager to go back to try different Meat and Heat mixes.